Welcome to the Wheels page. Here you will find more information about joining our Wheels. It consists of a 4 meter wide and 10 meters concrete long stand, which is followed by another 10 meters of grass long. Full stand has a 4 meter width. At our Wheels office you are able to register your vehicle. To speed up the process we advise you to register your vehicle beforehand. Two wristbands for adults will be granted as well. Our stewards will help you by putting them on. For this reasons all attendants need to be present at our office when arriving at the Wings and Wheels domain. Other, non-military vehicles will receive a RED, and free, support parking card. 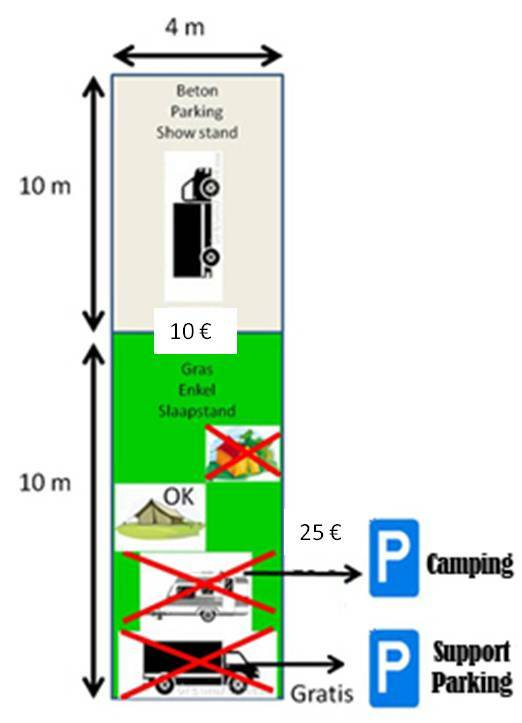 The support parking, however, is not a place for camping in any way (caravan, mobilhome, tents …). It is solely ment for parking your other, non-military vehicles. Should you have the need to stay the night, but you don’t have a military fashioned tent or anything, then you can do this on our specific appointed camping places. Your mobilhome, caravan or tent, joined by one vehicle can be placed on a camping spot. This spot costs €25 and can be requested when you arrive at the event. Toilets, showers and non-drinkable water are included in your reservation. When payment of €25 has been fulfilled you will receive a YELLOW parking card, to be displayed behind the windscreen. Entrance to the event and its domain is only allowed when you are approved by the Wheels Office. After your information, ID, subscription has been validated by the office you are allowed to enter. Per vehicle a €10 fee, for the full duration of the event*. Per vehicle, you will also receive two wristbands for adults. Children under the age of 12 are allowed to enter for free. Extra entrance tickets can be bought for €10 per day, €15 for the full weekend. *A vehicle that has not been subscribed before closing date (3rd August 2019) will have a total cost of €15 per vehicle. Subscribing your vehicle(s) can be done via the following page: Subscribe Wheels. Please enter all the required details and further follow-up will be done via e-mail. A confirmation of receipt of your subscription will be sent to you via e-mail. Please note, that subscribing your vehicle(s), and attending to the event is subject to our Terms and Conditions.